A sapling grows in the shelter of an older tree, where he is happy and safe. One day a violent storm destroys everything the sapling knows, and he suddenly finds himself unprotected and alone. But as the sapling grows, he gradually discovers that every end is a new beginning. Parker has written a simple, spare but descriptive text that shows us Tree's life from young seedling to mature tree. Kids will be able to draw parallels with their own lives, and gain an understanding of the cyclic and re-cyclic nature of Life. There are lots of subtleties in the illustrations to discuss with kids. They show us those affected by Tree: from insects and tiny mammals, to kids and adults. They show us the changing seasons and the increasing urbanisation of the nearby landscape. They show us the drama of Tree losing its sheltering protector and gently show us the parallel with humans we lose from our own lives. 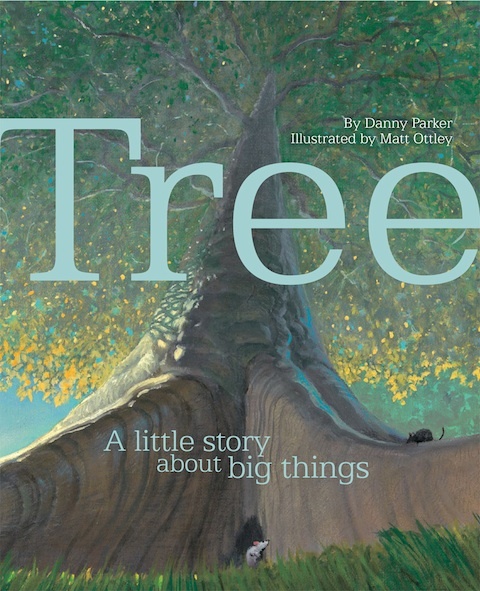 My copy of Tree is a hardback and the cover unfolds to make a beautiful poster, perfect for a classroom or library display. This is one of those children's picture books that stays with you long after you've read it. It changes the way you look at life, gives you a deeper understanding of things perhaps previously taken for granted. I recommend Tree to librarians as an environmental studies resource. I think it would also make an excellent choice for parents who want to introduce the circle of life to their kids. Gone straight on to my "to find" list! Thanks, Susan. @Playing by the book In an ideal world, we would have access to books globally! What a lovely looking title. The illustrations look gorgeous!